The tiny orbs extracted from oysters are nature’s magic at its best. Exuding exceptional translucence and natural lustre, pearl jewellery is celebrated across the globe and since ancient times it has been a hot favourite of the ladies. TJC brings for the women in the UK an eclectic collection of Pearl Rings at the most affordable prices. This distinctly feminine gem is the birthstone for the month of June and brings the serenity of the ocean along with. From delicate to bold and everyday pieces to occasion-wear, designer pieces from TJC featuring Freshwater, Japanese Akoya, Tahitian, South Sea and Coloured Shell Pearls will add the right amount of flair to your outfit. Elegantly set in 9K Yellow Gold or Sterling Silver with Gold and Platinum overlay, these rings are as vintage as contemporary and perfect to be worn across seasons. Pair a ring with pearls and diamonds with drop earrings and choker to add a dramatic effect to your ensemble for a wedding ceremony or pick the timeless and classic solitaire pearl ring to infuse elegance into your everyday look. Radiant and glowing, pearl’s beauty is spoken about in tales! It looks even more spectacular when it is paired with the traditional excellence of gold. 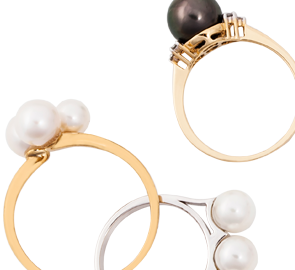 In fact, our classic and vintage pearl rings in yellow gold have garnered the appreciation of countless. We have an assortment of different tones in gold – the heirloom classic yellow gold, posh and pristine white gold, and charmer rose gold. From every day excellence to occasion-star, we have everything you’ll love. Another phenomenal range we present offers you pearl rings in silver. Promising a lasting wear, these delights will pair up perfectly with your flair of grace. Our excellent designs bring you the world, from the minimal simplicity of solitaire rings to the chaotic masterpieces in cluster rings. All you have to do is come and pick your favourite. You may also find silver plated with premium and lustrous metal tones like platinum gold, rhodium, and more such. The birthstone looks absolutely ravishing when it paired with diamonds. Our features of white freshwater pearl and diamond rings have especially set the fashion ablaze, owing to the sophisticated yet trend-worthy designs. The starry sparkle of diamonds blends perfectly with the moonlight charm of pearl, and this is what makes our features so absolutely coveted. Come and select that instant attraction-grabbing piece and win fashion with us. The beauty and lustre of a pearl are forever, and that is just what makes it ideal to be embedded in your engagement ring. TJC houses some excellent pieces of pearl engagement rings in UK that will win her over at the first glance. We offer several colours of pearls to choose from – golden, white, and black, among more shades. These forever bands have been made in simple yet stunning designs that you will be able to fashion forever. Seek that gorgeous piece that will make her say yes and be her companion for the rest of your lives! The answer to this question is seemingly simple. Our shop for online pearl rings in UK offers you the variety, quality, and price that you won’t find anywhere else. We house an unbelievably vast range of rings with pearls. We also offer several different types of real as well as simulated pearls. The options at TJC truly are countless. TJC offers you a fabulous grade and quality that you won’t find anywhere else. We believe in sourcing our own gems and our pearls have been hand-picked for delivering absolute perfection. Find charmers in our assortment of real pearl rings that display just the elite. Another reason for picking us has to be our pricing. We offer you a range of affordable pearl rings that are easy on the pockets. This is all done without compromising quality in any way. So, come and pick your perfects with us.